My test setup – bottom: ATMega16 with a 32k SRAM, 64k I²C EEPROM, top: 2*74HC573, 6532, LCD …and yes, it works on a breadboard. The minimum system consists of an ATMega32, an SRAM IC and some components to provide a clock source and an RS232 interface. Non volatile program storage can be added in an I²C EEPROM connected through a bilateral switch. Examples in the source code showcase, how parallel IO can be added from simple latches to 65xx IO ICs. 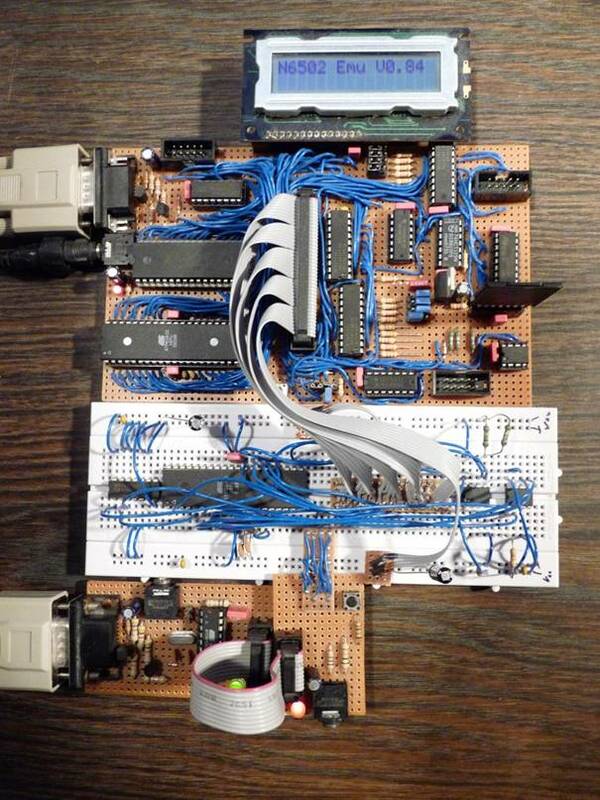 The achievable 6502 equivalent clock speed is approximately 2 MHz at 16 MHz ATMega clock. In order to combine the required IO blocks for your own SBC design, some AVR assembler knowledge is required. The emulator source code contains extensive comments about configurable items and the usage of emulated registers in the IO page. Version 0.8 is the initial release. 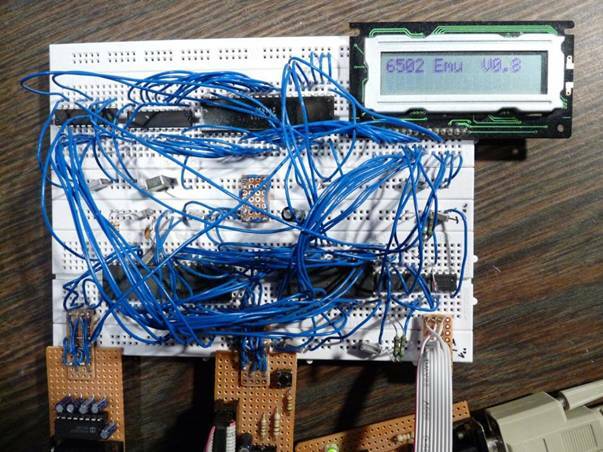 It has passed all tests of the emulated opcodes, IO loopback to I²C EEPROM, 74HC573 latches, a 6532 RIOT and a HD44780 compatible LCD. Version 0.81 – Added binary load/save/autoload support for applications. Added optional software flow control to RS232 receive buffer and tested with PuTTY and Tera Term. Modified EhBASIC for use with the emulator. Condensed all configurable items into a single include file. Added timer 1 access. Tested and improved interrupts. Version 0.82 – Added optional 65C02 opcodes emulation. Version 0.83 – Added breakpoint capability. Added SPI support. Added virtual but interruptible DMA for both I²C & SPI. Added documentation about customizing the AVR source and using the IO‑registers. Updated hardware and debugger documentation. Merged all documentation into a single document. Major update: the configuration include must be replaced with version 0.83. Version 0.83a – Modified atomic mode (irq_dis_real defined) to accept single step and NMI. Version 0.83b – Bug fixes only. Version 0.83c – Fixed DMA load program corrupted message. Added a switch to force hardware compatible results on invalid BCD. Added MMU support to switch banks, copy or swap pages between banks. Added SPI/I2C DMA support to read, write, save or load banks. The mainboard has 512k of RAM with MMU, connectors for ISP, main bus, SPI and I²C. IO selects 10-13 are used for on board units while IO selects 14-17 are available on the main bus extension connector. The jumpers to the left of the SD card are used to configure the inactive state of IO select 14-17. In addition to carrying the data byte and the low address byte the main bus extension can be configured with the jumpers at the bottom to carry either the high address byte, the IO select 2 byte (phi2 not available) or the IO select 3 byte (NMI not available). The SPI section has 3.3V voltage conversion to support an SD card. The jumpers to configure the 4 external slave select inactive states are at the top of the board. The I²C section has a 64k EEPROM. The new IO subprocessor is on the breadboard together with 2 serial EEPROMs to test the SPI and I²C hardware. An AVR910 programmer at the bottom is used to update the firmware of the subprocessor.